Air-to-air energy recovery generally refers to the process of recovering energy and/or moisture from an air stream at a high temperature or humidity to an air stream at low temperature or humidity This process has gained significant importance in the light of maintaining acceptable indoor air quality (IAQ) while at the same time maintaining low energy costs and reducing the overall energy consumption. Global warming is suspected by many to be the direct result of release of carbon dioxide and other greenhouse gases into the air during the process of energy generation from typical air exhaust. Our heat recovery ventilation units can handle corrosive exhaust air (for example; pool chemicals, salt air or other contaminates) with little or no maintenance and without cross contamination, a wide variety of applications are practical. The units used for this purpose are called sensible (temperature only) heat exchange devices or Heat Recovery Ventilators’ (HRV). The devices that allow transfer of both heat energy and moisture are known as ‘energy’ or ‘enthalpy devices’ or ‘Energy Recovery Ventilators’ (ERV). 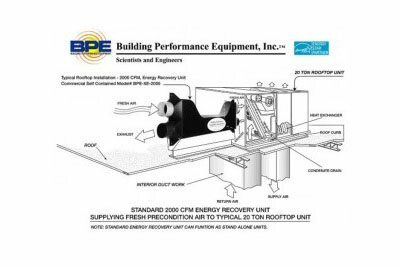 The BPE X-Type All Weather Heat Recovery Ventilator uses patented control logic, non-corroding monolithic polymer construction and advanced direct counter flow technology to process the incoming outdoor air. During operation, polluted exhaust air and the fresh incoming air exchange heat and cooling very efficiently. This virtually eliminates the need for further air tempering through the HVAC system. For example, with the heat exchanger providing an estimated airflow of 481 ft/min. 100°F outdoor air can be preconditioned to 74.1°F with 70.0°F room air temperature, no further cooling is needed. This allows the rehabilitation of existing buildings without extensive HVAC retrofits to meet IAQ standards and permitting requirements. Patented reverse counter flow construction. Reduces mechanical stress on HVAC system. No Cross Contamination- Airstreams never come into direct contact. Does not permit the growth of mold or mildew. Mechanically Sound with no internal moving parts to promote mechanical failure. The expected life cycle is in excess of 20 years. Polymer construction does not corrode or rust and is not effected by salt, water or other corrosive chemicals. Unit is powered by high efficiency inline fans (100 cfm at 19 watts). These enclosures are designed for nominal 2000 CFM or to be installed together for 4000 CFM or more as engineered with factory approval. Wall opening dimensions: 27″ wide x 50″ high. As specified by the engineer, the enclosure shall be either insulated double walled construction with 15/16″ thick insulating foam, or only for exterior use, single walled construction. The controls and electrical tie-ins are enclosed by a NEMA 3R enclosure or better. Drip pans shall be installed to drain to l/2” PVC connections. The contractor shall provide this drain connection in the field. It will drain as required by all applicable and local codes as needed to prevent any possible leaks. This will typically be similar to the draining requirements for other air handlers or evaporators with condensation. Rooftop mounted, 4 speed, microprocessor controlled, Dayton Direct Drive Blowers. Fans shall be shrouded for installation or shall be completely ducted for interior space application. Fantech inline fans are acceptable for high efficiency application as approved by the engineer. Low internal pressure drops are typical, allowing for an airflow of over 100 CFM with a 19 watt high efficiency inline fan. Larger units (2349 CFM) are powered with fans using 517 Watts (4.8 amps/ 115 volts) of power.